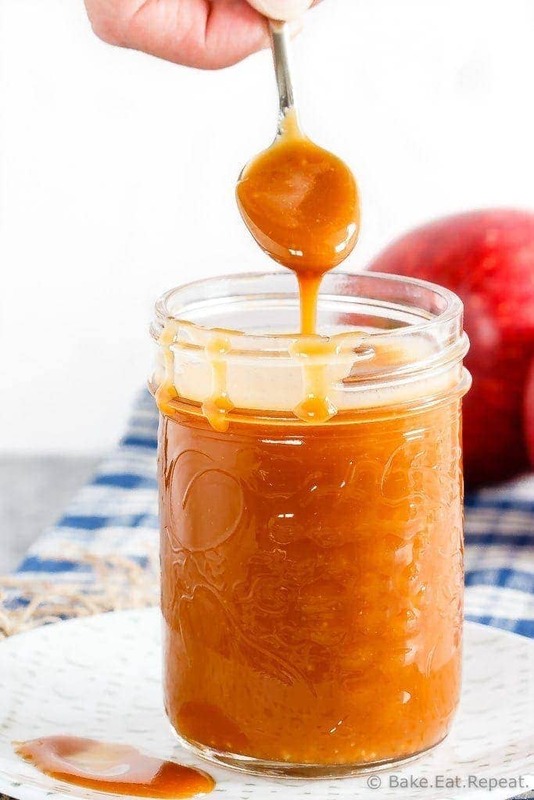 This homemade salted caramel sauce has just 4 ingredients and is so easy to make. 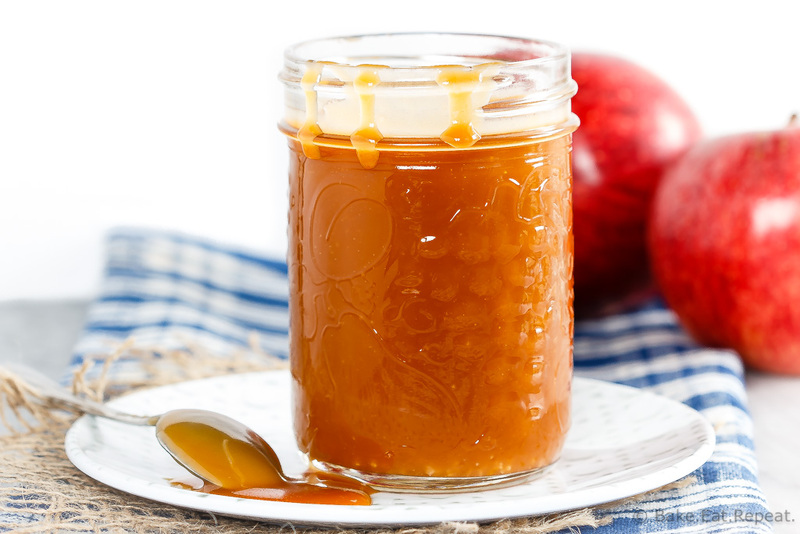 If you love salted caramel sauce, you need to try making it! Have you ever made homemade salted caramel sauce? If not, you should probably get on that. Immediately, if not sooner. 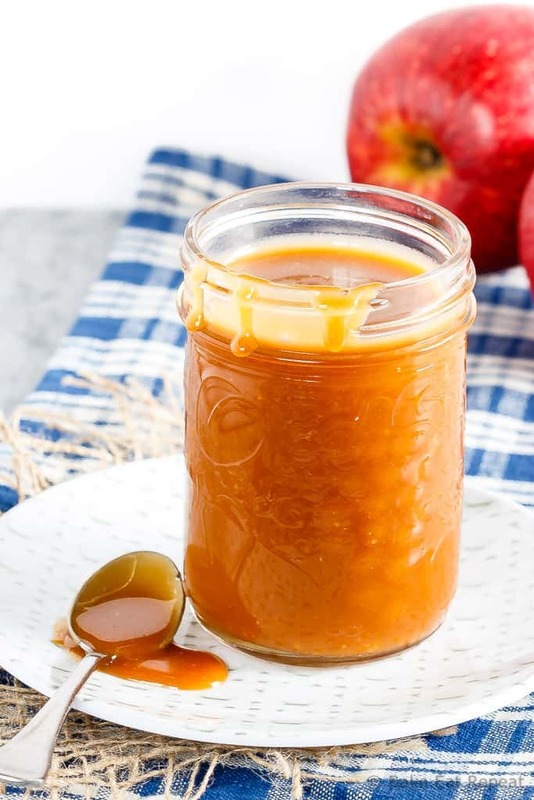 This easy homemade salted caramel sauce is absolutely fantastic. And that’s coming from someone who typically doesn’t really like caramel. Yeah, I’m crazy. I know. People inform me of that every time I say that I don’t really like caramel all that much. I think it’s just too sweet for me. Although evidently those feelings go out the window when it comes to salted caramel sauce. I think the salt gets rid of some of the sweetness, so I can get on board with it in this form. It’s still not chocolate – but it’s pretty tasty. Especially drizzled over apple slices. Or a bowl of vanilla ice cream. Or, if you really want to get crazy, over these apple pie bars with vanilla ice cream – that’s just dessert heaven right there. This salted caramel sauce is incredibly easy to make. It only takes about 15 minutes from start to finish, and you have a lovely jar of homemade sauce that beats anything you can get at the store. And it makes a perfect gift for the holidays, if you like gifting food! If you’ve never made your own, you should definitely try this recipe. It convinced me that I like caramel – so it must be fantastic! Place the granulated sugar in a large saucepan over medium heat. Stirring constantly with a rubber spatula, allow the sugar to heat. It will clump together as it starts to melt and then will start turning to liquid. Keep stirring so it doesn’t burn, until it is completely melted into an amber coloured liquid. Once the sugar is melted, immediately add the pieces of butter. The liquid will bubble up when you add the butter. Stir the caramel until the butter is completely melted, about 2 minutes. Slowly drizzle in the heavy cream while still stirring. Be careful as the caramel will bubble up a lot when you add the cream. Allow this mixture to boil for 1 minute, stirring constantly, and then remove from the heat. Stir in the salt and allow it to cool down a bit before using it, or pouring it into another container as it will be extremely hot. Cover it tightly and store it in the refrigerator for up to 2 weeks. You can warm it up in the microwave before using it. I like to scoop the amount I’m going to use into another small bowl to heat up, as I find microwaving it multiple times will cause it to not melt quite as nicely. This makes quite a salty salted caramel sauce, you can certainly decrease the salt to 1 teaspoon if you want the salted flavour to be a bit less pronounced. Make sure to use a large enough pan as the caramel does bubble up quite a bit. I made this today and it looked fine until i added the whipping cream. After that it was slightly too dark and has a small burnt aftertaste. Are there any tips you could give me? Oh, that's too bad! I haven't had that happen, but I'm thinking maybe your heat was a little high, or you cooked it a little too long before adding the butter and then the cream? I do it at medium heat, but your stove could run a bit hotter then mine - so you could try it at just below medium heat. Also, I add the butter as soon as the sugar is completely melted and there are no more lumps, I don't keep cooking it after it's melted before adding the butter. And the cream is added as soon as the butter is melted. I think if you tried a slightly lower heat that might help? My other thought is if you don't stir continuously while making it the sugar could burn and that could be the problem - so make sure all your ingredients are measured and ready to add before you start cooking the sugar so it can be stirred constantly. Hope that helps! Can you use half and half to make it a little more waist friendly? I haven't used half and half in this recipe, but I've seen similar caramel recipes with half and half instead of whipping cream so I would imagine it would be fine. It will likely be a bit thinner though. Let me know how it turns out if you try it! Well Stacey, I just had to write you, I made this sauce the other day with my Grandaughter and she just LOVED IT!! So much that a couple of hours later im calling out for my Granddaughter whom is not answering hearing her name called out, now mind you she is only 4yrs old. I decided to look in my kitchen as its her favorite place to be when she visits her Nana, well to my surprise my fridge door is open only to find my beautiful little blond hair blue eyed girl looking up at me sitting on the floor just COVERED in caramel sauce licking her fingers with the biggest smile i have ever seen. So happy & content. So i am to assume that she LOVES your caramel sauce.!! Thanks for the memories Stacey & keep up the good work.